Review Everything was very tasty and original, the decor was rich, the waiter adequately corresponded to all this. Thanks you! Review I’d like to note right away that I have been in many restaurants of the city. And believe me there are plenty to choose from! :))) I visited this great place several times, more often with friends, colleagues and guests of our events. Everyone really likes this restaurant! Starting with a meeting of visitors, continuing with serving dishes and table layout, finishing with food quality and creative approach to cooking! Original live music at the weekends is nice background for communication at the table with delicious national dishes. Sometimes the menu is updated to include interesting items, I liked it. Now I am a regular guest of this restaurant! Special thanks to administrators Yuliya and Dariya, as well as all staff for a special attitude to the guests! 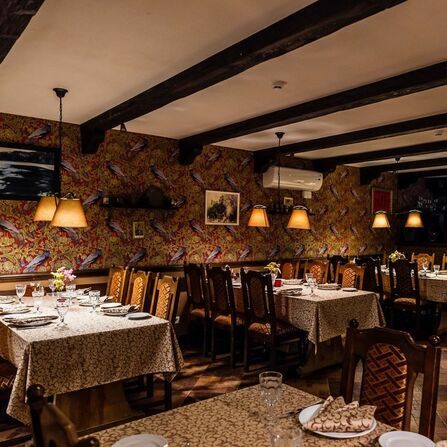 I recommend to everyone who wants to spend time in a cozy place with an original approach to old-Belarusian cuisine! Review There must be and feel this moment. After the bustle of the city here is very nice and cozy. All staff is very polite and not intrusive. From salad to dessert, everything is superb and taste and serve. A cozy country restaurant, surrounded by dense forest with clean air. Review We thank the whole team for the excellent organization of the New Year evening, and we are very grateful to the support staff !!! Everything was up to par, homely and very tasty !!! Thanks you!!! Our holiday was a success! Review Good evening. We visited this lovely place a few days ago. It was a delight. I want to thank the bartenders of your restaurant.... what amazing cocktails they make ... mmmmm ... Words cannot express their taste and beauty. And your brand liquers ..... I am lost for words.... Everything is at the European level and even better ... Staff is incredibly polite, nice, professional, and sociable ... Thank you for the evening. Review A bit late with the recall, but better late ... September 2 was the day husband's birth in falcone. They chose this restaurant because they wanted to try lobster, and cook it only there. As it turned out, chose not in vain. 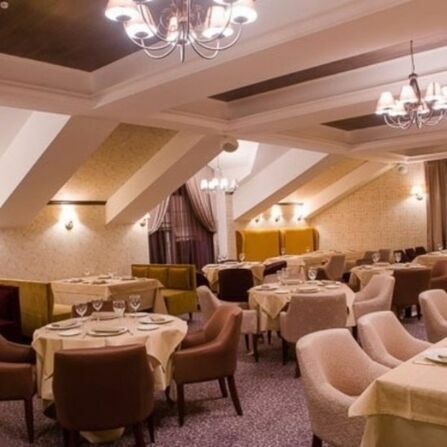 The restaurant impressed with its chic decoration, delicious food, perfect Service and pleasant atmosphere! As a surprise, her husband lit a candle at the dessert and wrote congratulations, which was very unexpected and pleasant! AT In general, I recommend to everyone. If we talk about the shortcomings, there was only one. I would suggest the hookah better to know the range of tobacco or organize Any kind of hookah card, and, in general, to improve the quality of this service. Thank you, Falcone! We will definitely come to you again! Review Perfect place! It is very comfortable, unusual and joyful at the same time (paintings with moustache). The atmosphere is created by brickwork, warm colors, and dim lights. Tasty and varied cuisine, very juicy. Beer is superb! We had a pleasant surprise – we were treated with a new ginger beer. It might have been a degustation that evening ... Beer was fabulous, light, and spicy. I was with the guests from Saint-Petersburg, everyone was very happy. The staff was very nice, thank you for a wonderful evening. I will come again! Review Thanks for the evening. Were today, we all very much. Cozy, beautiful. The service is top notch. Thanks a lot. Review Chic kitchen, great beer, nice staff. Everywhere is very clean. The best place to meet friends, colleagues and partners for informal communication. Over the years, the place only gets better. A separate respect for the children's slide, it's nice that you care about your little guests. Review We visited this beer cellar not by chance, but based on numerous positive reviews. And they did not regret it. Quick and friendly service and nice atmosphere. The basis is delicious dishes and beer. All at the highest level. Thank you for the nice time! A delicious gastronomic bar for a good evening. Today is a great reason to be in "Vmeste"! Review I am surprised. When there is a large European restaurant “background" , you don’t expect a miracle from Minsk places. But it is interesting to make discoveries. Why? Just because in the metropolitan restaurant landscape there are almost no places with traditions, with history, and with self-respect. And it's good when someone breaks stereotypes. Review In general, the impression of a visit remained very positive. Kitchen, interior liked. Although not all tables are lit enough. The service is good, but a little long serving serve a long wait for the waiter in sight to make an additional order. It turns out there was a 15% discount for the birthday, and we didn’t take a document confirming this fact. But even without a discount, the prices are quite reasonable. Review I can not share my emotions from going to this place! From the first minutes there was a pleasant impression from the welcoming meeting of the hostess! 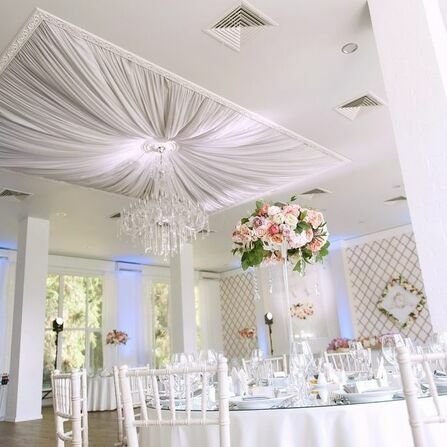 I also want to mention a beautiful interior, a gorgeous view from the window (I recommend therefore to take tables near the window), pleasant service - the waiters will be happy to help decide on wine / sparkling wine, the list of which in the menu is impressive with the variety of positions for any pocket. Another plus is live music! I am pleased to come back here myself and bring friends to once again enjoy the pleasant atmosphere of this institution! Review Good day! Were with his wife, quiet, cozy, tasty, service level! Thanks to the waiter, attentive! Review Good evening! I and a friend of mine visited Garden Café yesterday. The atmosphere was very nice and service was good, the taste of dishes was at the highest level. I would like to say special thanks to our waitress Darya, very welcoming and friendly girl. She could help and tell about the choice of dishes. We liked everything very much. Thank you for hearty welcome. Review September 7 celebrated a birthday at your restaurant! I liked everything very much! An interesting presentation of dishes, very tasty food, polite and very pleasant waitress Anastasia (special thanks to her) !!! My guests and I were very pleased !! Thanks a lot! Keep it up! Review We celebrated the birthday here. I liked everything - music, interior design, service, food. Everything was of top quality and at reasonable prices. Many thanks to Evgeniy for the excellent hookah and cheerful mood. We’ll definitely come here again. Review I liked everything, thank you very much. I make a suggestion change the dishware for authentic, it's gonna be great. We come to the restaurant not for the first time, I wish you much luck and success! Review Were recently with friends in your restaurant and left only good impressions. Good service, music. I would especially like to note the work of the waiter Diana, who is sympathetic, will help with the choice of dishes. A friendly administrator, Tatiana, met and immediately sat down at a good table. And of course, it is necessary to note the work of the kitchen: delicious dishes and large portions. Come back here again. Impressions remained good. Country eco-friendly restaurant with home food and a fireplace room. Review I am pleasantly surprised by the professional service of the staff, the main thing is that everyone is good-natured and ready for the client to do everything possible. Got pleasure! I will definitely call in. Everything was delicious! Review I do not know the names of top end restaurants where eat the last few reviewers, but my family visited this restaurant for the first time to celebrate a birthday party. It has a beautiful interior, nice staff, and cozy atmosphere. We ordered different dishes. BBQ ribs impressed me so much; I had such pleasure from the same dish only at the best restaurant in Warsaw. This is the first place in Minsk that could surprise me. Wonderful potato pancakes and pies. Meat and fish steaks ordered by the parents were absolutely delicious and had the required degree of doneness. Fantastic wine menu! And special thanks to the waiters. The service was subtle, but we never experienced lack of attention. I highly recommend visiting this restaurant. I already added it to the list of favorite venues and plan to come back with friends in the near future. Review Rested in a summer cafe. All liked it. Prices are reasonable. Yummy! Fun! The staff is very friendly and welcoming. Very beautiful! We will come again. Review Great place to brighten up the evening. Live classic music, amazing cuisine! Review We had dinner with a friend from France. Everyone was very pleased, comfortable interior, courteous and friendly staff, excellent cuisine! Thank you, I will definitely come again! Review Good varied menu, substantial portions, always polite and courteous staff. Also always a good choice of lunch menu. Definitely can be recommended to visit! Review A nice place – exactly what you need to have lunch or dinner with a good company. Delicious food and very good beer to every taste. Attentive but discreet staff. We visited this place for the second time and were satisfied again. Thanks! Review It is impossible to find beer tastier than here, at least in Minsk. We came as a big company, the level of service was excellent, portions were nourishing. I ordered pork ribs – it was yummy. Friends from Saint-Petersburg tried potato pancakes and were delighted!